WILLIAM HENRY SCHROEDER Born Bet. 1841 - 1855 in Hanover, Germany, in Holyhofen, Hanover, Germany, and died February 07, 1898 in Spring Creek Township, Black Hawk County, Iowa. He married EMMA SOPHIA BUTTKE June 14, 1877 in Zion Lutheran Church, Black Hawk Township, Black Hawk Co., Iowa, daughter of CARL WILLIAM and DOROTHIA LULOFF. She was born August 27, 1857 in Sheboygan, Wisconsin, and died November 11, 1942 in Waterloo, Black Hawk Co, Iowa. All information is provided by individual researchers and is accurate to the best of their knowledge. Always check the original source material to develope your own conclusions. 1. WILLIAM HENRY2 SCHROEDER (H. HEINRICH1) was born Abt. 1855 in Holyhofen, Hanover, Germany, and died February 07, 1898 in Spring Creek Township, Black Hawk County, Iowa. He married EMMA SOPHIA BUTTKE June 14, 1877 in Zion Lutheran Church, Black Hawk Township, Black Hawk Co., Iowa, daughter of CARL WILLIAM and DOROTHIA LULOFF. She was born August 27, 1857 in Sheboygan, Wisconsin, and died November 11, 1942 in Waterloo, Black Hawk Co, Iowa. Prussian or Saxony. The person that recorded his application (A. J.
to the village of Bruettendorf. Declaration of Intention Record: (not sure if this is the correct Wm. 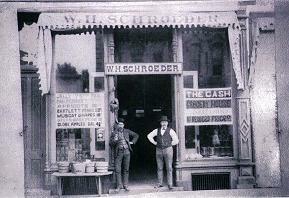 H.
February 7, 1898, Waterloo Daily Courier: W. H. Schroeder Dies. Summons Comes Quickly. While Walking on the Street He Falls a Victim to Heart Disease. —funeral Tomorrow. Wm. H. Schroeder died this morning of heart disease. The end came with a suddeness that was a great shock to his many friends and acquaintances. Mr. Schroeder had eaten his breakfast and about 8 o'clock started out to a neighbors on an errand. He seemed to feel remarkably well as he left the house, but he had gone scarcely more than half a block when the attack must have seized him. At about 8:15 he was found lying in the snow where he had fallen, by Mr. Carmichael, who lifted him up and helped him back to the house. Here restoratives were applied and for a few moments he seemed to improve. A physician was summoned but before his arrival Mr. Schroeder suffered another attack and death resulted at 8:30. Mr. Schroeder was born in Germany 43 years ago. He came to this country when he was a boy. For many years he lived in Spring Creek township. About 8 years ago he moved to Waterloo with his family and started a grocery store on East Fourth street. He didn't succeed well in business, however, and quit some time ago. He leaves besides his mother who is 74 years of age, his wife, a sister and seven children. All but two of the children are at home. The funeral will be held at the home, 113 East Seventh street tomorrow at 1 o'clock conducted by Rev. Geo. Sandrock. The burial will be in the cemetery at Spring Creek. been a Black Hawk County resident for 76 years. She suffered a broken hip in a fall two weeks ago. 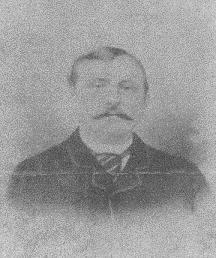 H. Schroeder, who died in 1897. She was married to Henry W iddel in 1900, and he died in 1931. R. Schroeder, Camp Cooke, Cal. ; Herbert A Schroe der, Alhambra, Cal. ; Mrs.
J. H. Fisher, Aredale, Ia. 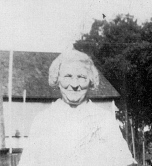 ; Mrs. George Buchan, Ced ar Rapids, Ia. ; Mrs.
Pullin, and Mrs. H. E. Benorden, Jesup, Ia. 45 grandchildren and 20 great-grandchildren. A son and daughter are dead. Mrs. Widdel was a member of Trinity American Lutheran Church. prayer service in the Kearns Garden chapel at 1:30 p .m. i.	HERBERT ALFRED3 SCHROEDER, m. CATHERINE MCDONALD. At the time of his mother's death, he was living in Alhambra, California. 2.	ii. ROSA CHRISTINE SCHROEDER, b. May 08, 1881, Black Hawk Co., Iowa; d. May 14, 1957. 3.	iii. EMMA DOROTHIA SCHROEDER, b. March 04, 1883, Waterloo, Iowa; d. March 13, 1912, Spring Creek Township, Black Hawk Co., Iowa. iv. HERMAN SCHROEDER, b. May 09, 1884, Black Hawk Co., Iowa; d. September 25, 1886, Black Hawk Co., Iowa. v.	LYDIA E. SCHROEDER, b. October 04, 1885; d. November 14, 1961; m. GEORGE BUCHAN. 4.	vi. ANNA MATILDA SCHROEDER, b. February 26, 1887; d. April 13, 1981, Waterloo, Black Hawk Co, Iowa. 5.	vii. LOUIS REINHARDT SCHROEDER, b. April 17, 1889, Waterloo, Iowa; d. February 15, 1967, Los Angeles, California. 6.	viii. CLARA JOSEPHINE SCHROEDER, b. August 04, 1890, Black Hawk Co., Iowa; d. November 04, 1946, LaPorte, Black Hawk Co., Iowa. 2. ROSA CHRISTINE3 SCHROEDER (WILLIAM HENRY2, H. HEINRICH1) was born May 08, 1881 in Black Hawk Co., Iowa, and died May 14, 1957. She married FREDERICK HENRY FISHER November 17, 1900 in Buttler, Iowa. 8.	ix. HERBERT FISHER, b. April 01, 1903; d. November 1965, Lime Springs, Iowa. x.	EMIAL FISHER, b. December 08, 1907; d. September 1975. 3. EMMA DOROTHIA3 SCHROEDER (WILLIAM HENRY2, H. HEINRICH1) was born March 04, 1883 in Waterloo, Iowa, and died March 13, 1912 in Spring Creek Township, Black Hawk Co., Iowa. She married (1) UNKNOWN HEIPLE. She married (2) WILLIAM LULOFF July 04, 1907 in Black Hawk Co., Iowa, son of FRANK LULOFF and AUGUSTA GOSSE. He was born January 28, 1883 in Buchanon Co., Iowa, and died May 25, 1962 in Jesup, Buchanan Co., Iowa. He was a r etired farmer and a member of the American Lutheran Church. Burial was in Ced ar Crest Cemetery in Jesup. witnesses. Paster J. B. Metcalf. i.	EVELYN4 HEIPLE, b. November 18, 1903, Black Hawk Co., Iowa; d. August 1989, Michigan; m. OSCAR IDE. 9.	ii. ESTHER G.4 LULOFF, b. June 18, 1909, Jefferson Township, Buchanan Co., Iowa; d. October 26, 1989, Waterloo, Black Hawk Co, Iowa. 4. ANNA MATILDA3 SCHROEDER (WILLIAM HENRY2, H. HEINRICH1) was born February 26, 1887, and died April 13, 1981 in Waterloo, Black Hawk Co, Iowa. She married RUSSELL E. PULLIN October 18, 1906 in Buchanan Co., Iowa. He was born June 07, 1881 in Pennsylvania, and died February 16, 1941 in Orange Township, Black Hawk Co., Iowa. Mrs. Anna Pullin, 94, of 5065 Hoff Road, funeral services will be 2 p.m.
S he died at the American Healthcare Center, Monday afternoon. 1906, Black Hawk County. He died in 1941. Avenue; th ree sons, Harold of 8510 Hammond Avenue, Donald of 1925 W.
great-grandchildren and eight great-grea t-grandchildren. had a stroke in July 1980 - so was complete ca re from then on..."
Well known as Breeder of Purebred Sheep, Winner of National Prizes. members of his family found him in the barnyard shortly after 1:15 p.m.
on their return from United Brethren church services here. unconscious. His cap was 100 feet from his body, the fa mily said. th ere will be no inquest. township trustee. He was also a vice president of the Hudson , Ia. a.m. Sunda y, leaving Mr. Pullin in the farmyard at work. drove to Presbyterian hospital, where he was pronounced dea d.
resided at his Orange township farm. Elbow Lake, Minn., and Mrs. C. F. Loonan, Hudson, Ia..
i.	HAROLD4 PULLIN, b. October 27, 1907. 10.	ii. DONALD PULLIN, b. April 17, 1909; d. March 11, 1989, Waterloo, Iowa. iii. GLADYS PULLIN, b. August 30, 1911.
iv. RUTH M. PULLIN, b. January 04, 1914, Waterloo, Black Hawk Co., Iowa; d. November 19, 2001, Waterloo, Iowa. Nov. 19, of natural causes. retiring in 1980, and was past president of West Orange Club. from 4 to 6 p.m. Friday at Loc ke Funeral Home. v.	EDWIN PULLIN, b. August 08, 1915.
vi. DELORES PULLIN, b. October 04, 1919.
vii. VIRGINIA PULLIN, b. October 10, 1921.
viii. PHYLLIS PULLIN, b. May 07, 1926; d. May 07, 1926.
ix. WILLIS PULLIN, b. May 07, 1926; d. May 09, 1926. He was a twin brother to Phyllis but only lived two days. 5. LOUIS REINHARDT3 SCHROEDER (WILLIAM HENRY2, H. HEINRICH1) was born April 17, 1889 in Waterloo, Iowa, and died February 15, 1967 in Los Angeles, California. He married ANNA KATHERINE VITANOVEC, daughter of JANOS VITANOVEC and ANNA SEMIG. She was born July 25, 1889 in Wilkebam, Lazurne Co., Pennsylvania, and died March 13, 1990 in San Diago, California. i.	CECELIA THERESA4 SCHROEDER, b. August 03, 1923, Pennsylvania. 11.	ii. EMMA KATHERINE SCHROEDER, b. August 1925, Fort Eustess, Virginia. 12.	iii. EUGENE JOSEPH SCHROEDER, b. July 08, 1927, Waterloo, Black Hawk Co., Iowa; d. October 18, 1981, Chattanooga, Hamilton Co., Tennessee. 6. CLARA JOSEPHINE3 SCHROEDER (WILLIAM HENRY2, H. HEINRICH1) was born August 04, 1890 in Black Hawk Co., Iowa, and died November 04, 1946 in LaPorte, Black Hawk Co., Iowa. She married HERBERT E. BENORDEN October 06, 1910. He was born 1889, and died May 17, 1976 in Black Hawk Co., Iowa. i.	AARON4 BENORDEN, m. BEVERLY MOORE. 13.	ii. ESTHER MARIE BENORDEN. 14.	v.	RUTH E. BENORDEN, b. 1913. 15.	vi. PAUL REINHARDT BENORDEN, b. October 19, 1918; d. January 30, 1980, Black Hawk Co., Iowa. vii. MAE BENORDEN, b. May 09, 1926.
viii. RALPH BENORDEN, b. May 09, 1926, Black Hawk Co., Iowa; d. May 13, 1926, Black Hawk Co., Iowa. ix. INFANT BENORDEN, b. September 29, 1928, Black Hawk Co., Iowa; d. September 29, 1928, Black Hawk Co. Iowa. 7. PAUL4 FISHER (ROSA CHRISTINE3 SCHROEDER, WILLIAM HENRY2, H. HEINRICH1) He married EVA. 8. HERBERT4 FISHER (ROSA CHRISTINE3 SCHROEDER, WILLIAM HENRY2, H. HEINRICH1) was born April 01, 1903, and died November 1965 in Lime Springs, Iowa. He married BERTHA L..
ii. LEO H. FISHER, b. February 24, 1929; d. September 03, 1982. 9. ESTHER G.4 LULOFF (EMMA DOROTHIA3 SCHROEDER, WILLIAM HENRY2, H. HEINRICH1) was born June 18, 1909 in Jefferson Township, Buchanan Co., Iowa, and died October 26, 1989 in Waterloo, Black Hawk Co, Iowa. She married RONALD BUELO June 19, 1948 in Buchanan Co., Iowa. He was born August 24, 1910, and died November 02, 1994. Center at Kimball Avenue, Waterlo o, of heart failure. Church, Jesup, with burial in Jubilee Cemetery. June 19, 1948, in Buchanan County. They were later divorced. She wa s preceded in death by one half-sister, Evelyn Ide. 10. DONALD4 PULLIN (ANNA MATILDA3 SCHROEDER, WILLIAM HENRY2, H. HEINRICH1) was born April 17, 1909, and died March 11, 1989 in Waterloo, Iowa. He married BLANCHE S. WILSON June 16, 1932 in Hudson, Iowa, daughter of ALFRED WILSON and VERNA WATTERS. She was born October 07, 1912 in Hudson, Iowa, and died January 09, 2002 in Waterloo, Iowa. Jan. 9, at Parkview Manor, Reinback, of natural causes. W atters Wilson. She married Donald F. Pullin on June 16, 1932, in Hudson. He d ied March 11, 1989. Alfred "Bud" Wilson; and her twin sister, Beulah Peterson. with burial in Orange Township Cemetery. 11. EMMA KATHERINE4 SCHROEDER (LOUIS REINHARDT3, WILLIAM HENRY2, H. HEINRICH1) was born August 1925 in Fort Eustess, Virginia. She married ELMER "SLIM" BUSHORN November 25, 1945. Burned in a barn fire and died a few days later. She was about 4 years old. 12. EUGENE JOSEPH4 SCHROEDER (LOUIS REINHARDT3, WILLIAM HENRY2, H. HEINRICH1) was born July 08, 1927 in Waterloo, Black Hawk Co., Iowa, and died October 18, 1981 in Chattanooga, Hamilton Co., Tennessee. He married MILDRED G. REESE February 22, 1953 in Pelzer, South Carolina, daughter of ERNEST REESE and ETHEL LITTLETON. She was born June 15, 1927 in Anderson County, South Carolina, and died January 15, 2010 in Chattanooga, Hamilton County, Tennessee. killing him for no other purpose but taking the few dollars he had,"
prosecutor Bill Cox told a criminal court jury Wednesday afternoon. courtroom at the Justice Building. 20, and Jeffrey wayne Hunnicutt, 19.
to the guilt of the two defendants. found by police at Lakesite inside his cab "breathing his last breaths." H e said he died "from four .38-caliber projectiles." (at the Trailways bus station) the la st passengers he would ever carry." is black and Hunnicutt is white. positively point to them in court, it w as stated. the cab a short time after the cab driver was found, the jury was told. and also the wal let, flashlight and weapon of the cab driver Schroeder. The incident occurred on October 17, 1981.
degree murder and armed robbery of Yellow Cab dr iver Eugene Schroeder. i.	GARY5 SCHROEDER, b. November 05, 1956, Anderson County, South Carolina; m. (1) KATHY PENNIX, February 14, 1978, Red Bank, Hamilton County, Tennessee; m. (2) SHARON MANERY, October 14, 2000, Signal Mountan, Hamilton County, Tennessee. There are no children to either marriage. ii. BARRY HORACE SCHROEDER, b. November 24, 1958, Anderson County, South Carolina; m. GLENDA LOUISE PARKER, January 15, 1980, LaFayette, Georgia; b. January 05, 1959, Water Vliet, Michigan. 13. ESTHER MARIE4 BENORDEN (CLARA JOSEPHINE3 SCHROEDER, WILLIAM HENRY2, H. HEINRICH1) She married OSCAR CARL HARTING Private, son of CHARLES HARTING and CHRISTINE HOPPE. He was born September 25, 1913 in Black Hawk, County, Iowa, and died October 26, 1992 in Black Hawk County, Iowa. i.	GARY5 HARTING, b. April 10, 1940; m. DONNA LAVERNE ECK, March 21, 1964; b. August 04, 1945.
ii. RONALD EUGENE HARTING, b. July 29, 1944; m. JANE MARIE COMFORT, June 05, 1965; b. June 10, 1946. 14. RUTH E.4 BENORDEN (CLARA JOSEPHINE3 SCHROEDER, WILLIAM HENRY2, H. HEINRICH1) was born 1913. She married JAMES V. GREENWAY. He was born 1911. 15. PAUL REINHARDT4 BENORDEN (CLARA JOSEPHINE3 SCHROEDER, WILLIAM HENRY2, H. HEINRICH1) was born October 19, 1918, and died January 30, 1980 in Black Hawk Co., Iowa. He married BEVERLY J. FISHER July 20, 1940.